Up until I was about nine or so, I always thought these were called ‘plain trees’ – no special name, just your common-or-garden, standard variety tree. In London, where I lived, they’re all over the place, so it seemed a reasonable assumption. In fact it’s spelled ‘plane’ and they are London Planes, Platanus × hispanica (or × acerifolia). 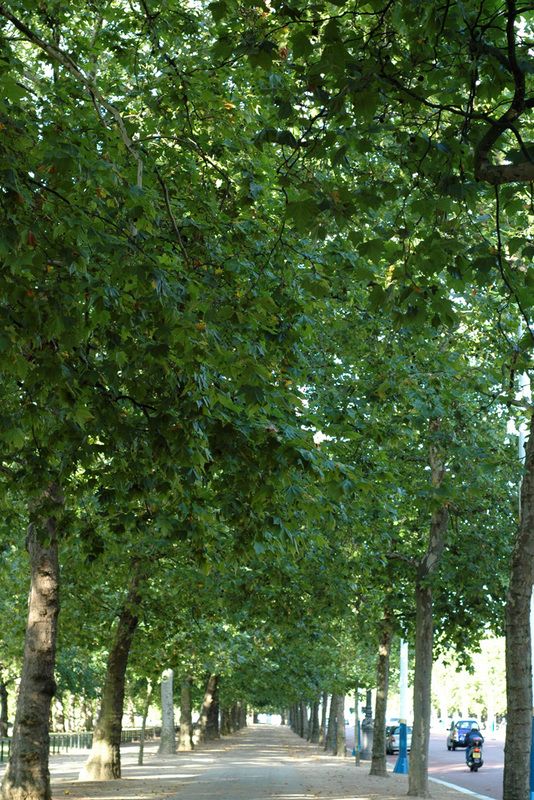 The London Plane is a hybrid of two trees from either side of the world, Platanus orientalis and P. occidentalis. The Eurasian one, orientalis, is obviously the closer to home for me and is the one that interests me more. It (like the London plane) is huge, beautiful, sturdy, fast-growing and long-lived — they’re particularly revered in Greece, where at Kos, there’s one that’s supposed to be 2,400 years old under which Hippocrates taught medicine. The leaves can be used to treat certain eye problems, and while (unlike me) the plane tree is super tough and hardy, (like me) it loves and needs sunlight — in fact, from one of the tree books I love so much at the national library I’ve made a note of the decisive sentence, ‘It cannot grow in the shade’. Really though, for me, this one is about where I’m from and remembering how much good and beauty and strength I get from that. My other two leaves, for their own reasons, are to do with growth and newness, looking forward and finding my own way in the world, my place in Edinburgh, where I’m at or where I’m going more than where I’ve been. This leaf, which I picked up last time I was down there on my way to Camp for Climate Action 2008, is to balance that out a bit, is about recognising that the past is wonderful too and that, as I keep saying, I’m very lucky and blessed to have such fantastic people in my life who have always been there for me. To remind myself, perhaps, a little, that it’s not always all about what’s new: you need roots and wings. Home and family are all mixed up together for me; memories of London are inevitably memories of my brother, my parents, and my sister’s birth. Memories of primary school and starting to know myself, learning to learn. The first pavements I ever walked were scattered with plane leaves, and so this seems only natural, simple and right. [T]hose natural forms which are at once most familiar and most delightful to us, as well from association as from beauty, are the best for our purpose. The rose, the lily, the tulip, the oak, the vine, and all the herbs and trees that even we cockneys know about, they will serve our turn better than queer, outlandish, upsidedown-looking growths. If we cannot be original with these simple things, we shan’t help ourselves out by the uncouth ones.